Just learned how to uninstall Microsoft's Clickonce support for Firefox. When you are a Microsoft customer by using e.g. Windows XP like me; and you update regularly then you might have wondered some time ago that a new addon misteriously appeared in Firefox. This Microsoft explains some of it and how you can tweak the registry to get rid of it again. Yig. This is too much customer care for my taste. Or too less when you have to edit the registry to clean your computer from unwanted helpers. Not good. 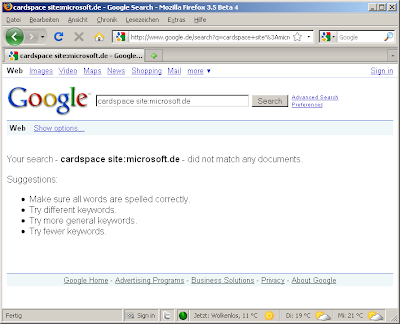 Your search - cardspace site:microsoft.de - did not match any documents. Not good! It seems that the German Microsoft site is not searched by Google. Strange. Searching for Cardspace at search.microsoft.com results in an interesting suggestion: "Meinten Sie vielleicht: cards pace" (did you mean 'cards pace'). It seems that search.microsoft.com does not know Microsoft products. "J2SE 5.0 is in its Java Technology End of Life (EOL) transition period. The EOL transition period began April 8th, 2008 and will complete October 30th, 2009, when J2SE 5.0 will have reached its End of Service Life (EOSL)." While playing around with some SUN developement kit and trying to build the samples I got the error message that the version of the class files do not match. One gets this error message when some jar file was generated with another version of Java... Some time ago I deinstalled all old versions of Java from my computer keeping only the Java 6u13 JDK. It turns out that I need Java 5 to build the samples. Not good. I downloaded java 5 and succeeded to build the samples... But anyway SUN should see to it that this does NOT happen. Especially with its own SDKs. I already deinstalled java 5 again, but will keep the installer on disk for future incidents like this. Another pain point: What about J2ME? Are there any plans to update this java-1.3-ish language to java6? Android has java 6 but that is another league. Just wanted to try Facebook as an OpenID consumer. 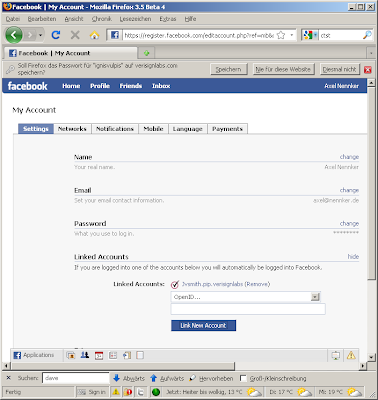 So I undusted that Facebook account and added my verisignlabs openid ignisvulpis.pip.verisignlabs.com to my profile. When I come back from verisignlabs Facebook presents my updated profile. 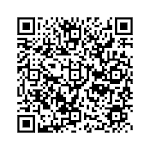 My openid is presented to me as: jvsmith.pip.verisignlabs.com which points to the correct openid. What is going on here? I quick search reveals that others have the same problem... Strange. Normally I do not blog about my employer but this time I would like to make an exception. 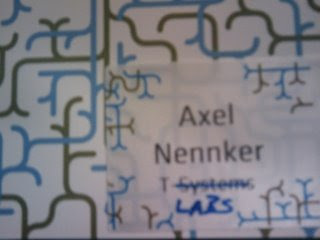 - create an STS that issues IP location cards. When the user uses this card at a relying party the IP location STS resolves the IP Location and puts the location information into a SAML assertion. Easy. 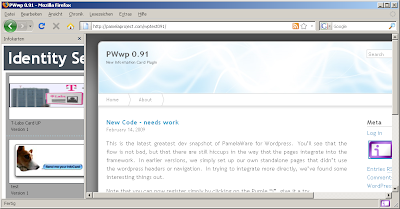 - create a Firefox 3.x (x>0) location provider that uses the IP location service in the browser. I guess that raises some location provider and browser location GUI issues. Doable. Anyway. I do believe that relying parties want location information and that Information Cards are a good way to provide claims about a user with the user's consent. This again raises the issue that we need security tokens that hold claims values assured by multiple sources (IdPs). But maybe this does not really matter. The user does not know about all the underlying technology and he should not need to care about it. I am thinking about a UI where the cards (and the claims) are presented to the user, who then drags the cards or only some claims from several cards to the relying party. The selector then fetches the security tokens from the multiple IdPs and sends the multiple security tokens to the relying party. How does the selector know about where to post what claims? Through XRD. The Internet Identity Workshop seems to inspire me to work more on the openinfocard selector again. I just uploaded a new version. Drag and Drop of Information Cards works again. You can open the sidebar using shift-alt-ctrl-i and then drag one of your cards to the main window (relying party). The selector then opens and the dragged card is choosen. You just need to hit the "send" button or select some optional claims first. to your site and you use openinfocard then you can use Information Cards without the "object"-HTMLElement. Today at the European Identity Conference we had a workshop on forming a local chapter of the Information Card Foundation. We intend this to be a local chapter for Switzerland, Austria and Germany. We want to provide helpful information about Information Cards in the German language, we want to be a neutral body and an open organization, we want to organize and participate in events and workshops, we want to identify local requirements and local legislation related to Information Card Applications and we want to solve or to help solve challenges related to those local requirements and restrictions. In our first workshop today we had many interesting presentations from very different companies and organizations. I won't repeat them here other then to note that probably all aspects of the Identity Metasystem were covered. That kind of surprised me, but it was a good surprise because it reminded me that there are more aspects to this other than the projects I work on. I thought that my openinfocard project and the Cardspace4Firefox project cover the selector part, that my divers work projects cover consumer, enterprise and mobile devices parts of the systems and the interoperability and standards aspects and that this is most of the "world" but of this of course not true. I was remembered that there is even more than this already huge field. That is good.